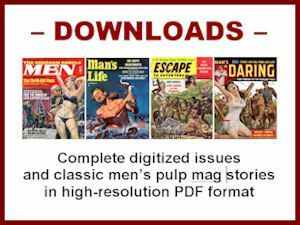 Men's Adventure Magazines: Mort Kunstler – plus Survival at Sea: Part Deux. My previous “survival at sea” post showed some great men’s adventure magazine covers. Since tales of survival in lifeboats and life rafts were a popular subcategory of stories in men’s pulp mags, there are many other great ones. For example, the cover at left, from the January 1959 issue of True Action magazine, has a terrific cover by the illustrious American artist, Mort Kunstler (b. 1931). The headline for the story it goes with suggests the, um, thrust of the story: THE GORGEOUS CASTAWAYS: SURVIVOR CARMODY’S TWO GIRL PARADISE. For the record, I know Kunstler’s name has a German umlaut accent above the “u” – like this: Künstler. 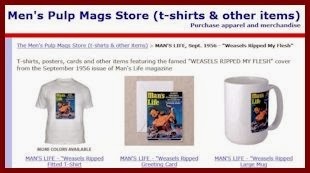 Kunstler has been so prolific and his body of work so diverse, that the biography on his official web page doesn’t mention his fame among aficionados of men’s pulp mags. 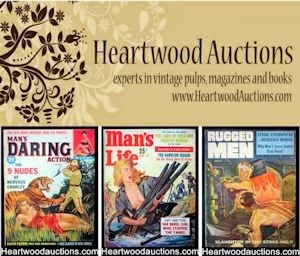 But if you search for men’s adventure magazines on eBay or vintage magazine sites, you’ll see that sellers who know their stuff note in descriptions when a magazine has a Kunstler cover. His name will automatically increase interest and the price. Nowadays, Kunstler has wider fame for his historical paintings. He is especially renowned for his paintings of Civil War events. I’m a fan of Kunstler’s Civil War stuff, too. 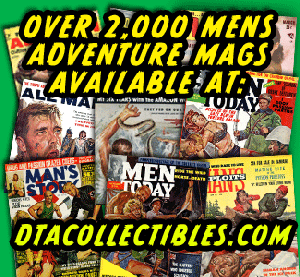 But I’m an even bigger fan of the action-filled, hyper-realistic artwork he did for men’s adventure magazines. And, although Kunstler set a very high standard, many other talented illustrators did equally cool cover paintings for the men’s postwar pulp mags of the 1950s, 1960s and early 1970s. Below are some more examples in the “survival at sea” subcategory, by some other great artists who did covers for men’s adventure magazines: George Gross, Lou Marchetti, George Mayers and Rafael DeSoto. 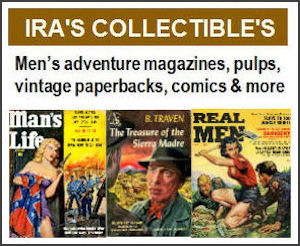 These are from the classic men’s pulp mags Action for Men, O.K. for Men, Real and Men in Adventure.